Tzatziki is a traditional Greek dip, known and loved by everybody within Greece and abroad. It is a classic Greek sauce with yogurt, cucumber and garlic. It sounds very simple, but if we want to achieve the ideal texture, we need to pay attention to small details. The base ingredient for homemade tzatziki is good Greek yogurt; plain, fresh, creamy and dense. Greek Tip #1: Make sure your yogurt is as dense as possible. If it is not, you can strain it, using a cheesecloth (the yogurt I used was dense enough, so I didn't have to strain it). If you don’t have a cheesecloth, place a kitchen towel or any type of cloth (make sure it is white, clean and doesn’t have any lint) in a large bowl and plop the yogurt in. Bring together the four corners of the cloth and lift the yogurt over the bowl or the sink. Twist the corners, to squeeze out the water and continue squeezing, putting the yogurt under pressure to force the water out. After that, open the cloth and put the yogurt in a bowl for use. Keep in mind that straining your yogurt is going to reduce its volume. The most important ingredient for the sauce is cucumber. You need to get the seeds (if any) out of the cucumber, because they add moisture to the mixture and who wants to have a watery sauce? 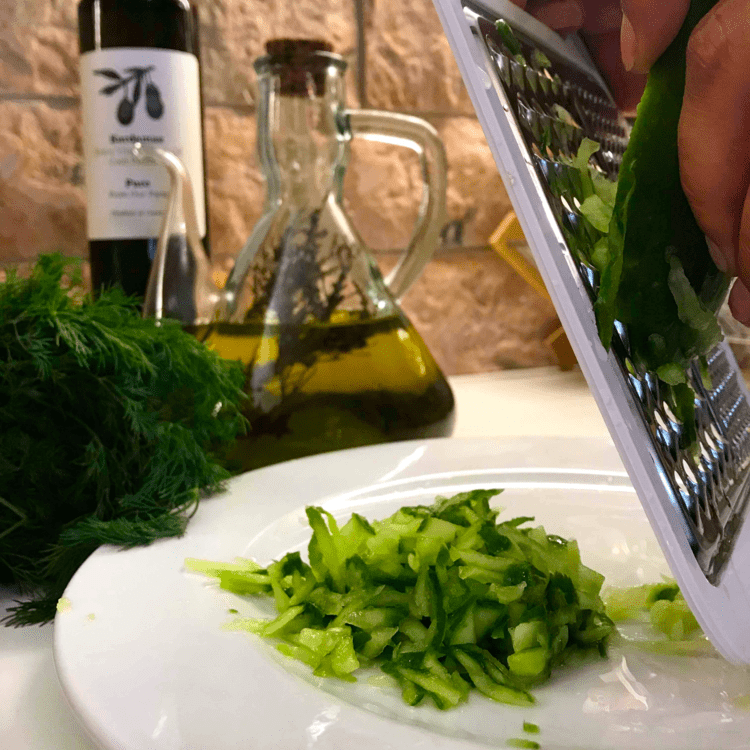 For the original Greek tzatziki recipe, the cucumber is grated on the thick side of the grater. Keep the peel on for extra fiber and color on your plate! Greek Tip#2: Once the cucumber is grated, it needs to be strained too. 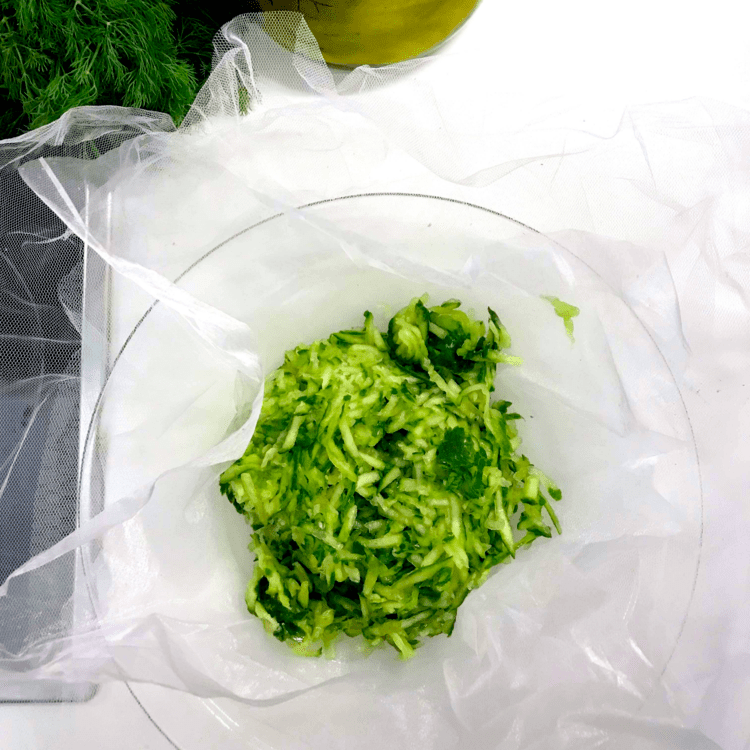 Just lay it on your cheesecloth or the cloth you used for the yogurt (I used three pieces of tulle to strain it), sprinkle it with some salt and let it sit for a few minutes (the salt helps to draw the moisture out for the cucumber). Then, you can strain it the same way you stained the yogurt. To make traditional, delicious Greek tzatziki, you are going to need garlic. If you do not mind its strong smell, use a little more. Your palate will thank you! Greek Tip#3: Make sure the garlic is properly melt, chopped or grated on the fine side of the grater, otherwise it may spoil the texture of the sauce. Mix together the yogurt, the garlic, the cucumber and the olive oil in a large bowl. Add the salt and vinegar last, depending how intense you want the favor and voila!! Greek Tip #4: Don’t be afraid to experiment on the vinegar and salt. The quantities are indicative. For better taste, leave your Greek tzatziki in the fridge for a couple of hours. This way you will allow it to sit and make the flavors less tangy. Actually, it should taste its best the next day! Pretty much with anything. Try it with hot grilled vegies, pitas or meat. Just make sure your food is hot and your tzatziki cold. Emma’s Greek Tip: Dip your hot french fries in cold Greek tzatziki and don’t share with anybody!! 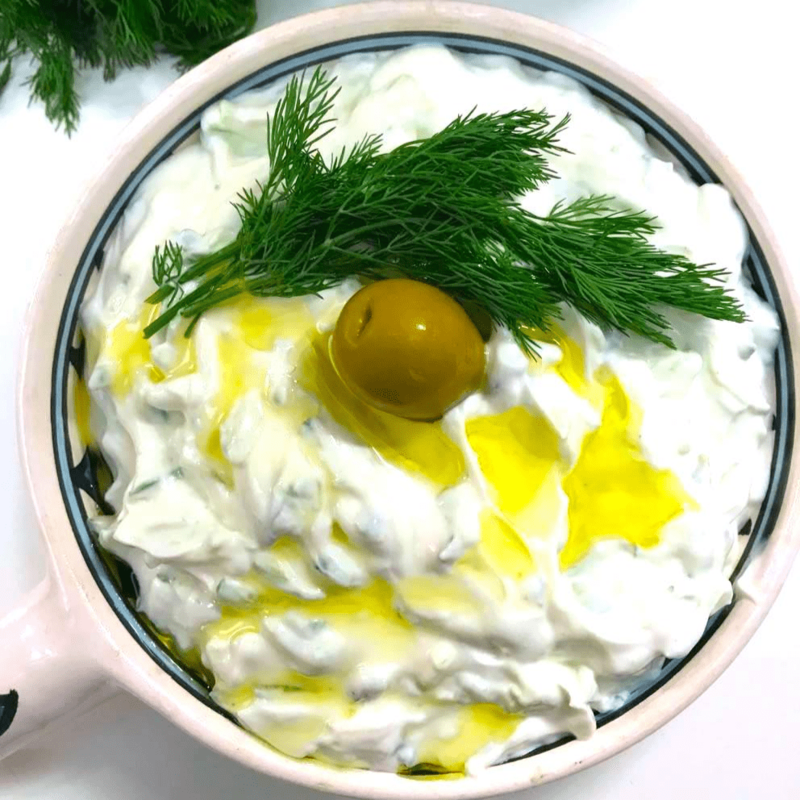 If you replace garlic with some fresh, chopped dill, keeping the rest of the ingredients as is, you will get a delicious variation of tzatziki, without the intense taste and aroma of garlic. Also, keep in mind that garlic tends to lower blood pressure. Trust me, it's worth a try!